Vasek Pospisil is a promising Canadian 26-year-old whose career has been bumpy due to injuries and inconsistent results, but people who have seen him play knows he has the game to beat pretty much anyone. Yesterday he showed that to everyone when he beat current world number one Andy Murray in Indian Wells 6-4 7-6. Pospisil followed the medicine of Mischa Zverev, who beat Murray in the Australian Open earlier this year, and attacked the net like a mad dog. This allowed Murray to hit some textbook lobs, but the constant pressure made it hard for him to find his groove and he made some uncharacteristic mistakes. It wasn’t really that Murray was bad, it was Pospisil who took the game to him. This is a site primarily focused on tennis racquets and strings, so you’ll surely ask, what racquet does Pospisil use? Well, Pospisil endorses the Wilson Burn line, but is actually using his old Wilson Six One 95 in 18×20 string pattern underneath the Burn paint job. I’m not sure which edition of the esteemed and excellent Six One 95 line he is using (my guess is the Hyper ProStaff 6.1, which is the same like Del Potro), but they’re all good: Wilson Pro Staff Classic (has been re-released in a 25th Anniversary edition), Wilson Hyper ProStaff 6.1 , Wilson nCode 6.1 95, Wilson BLX 6.1 95, Wilson BLX2 6.1 95 (Amplifeel) and the latest edition with parallell drilling that is currently available at Pro Direct Tennis. Pospisil string his Wilson Six One 95 with Luxilon Alu Power (mains) in a hybrid with Wilson Natural gut (crosses). 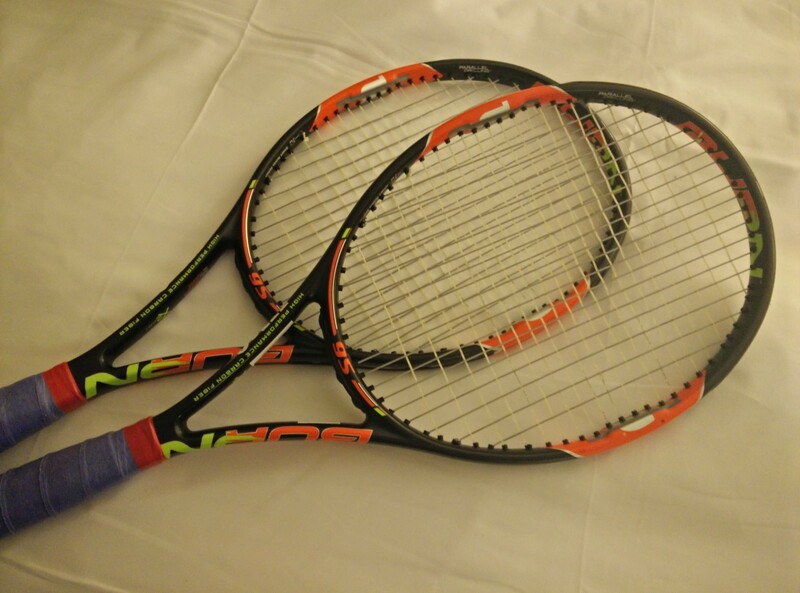 This combination can be find already packaged in Wilson Champions’ Choice (Federer’s string of choice). Pospisil’s racquets with the old Wilson Burn paint job. Notice the lead tape at 3 and 9. Image from poster Shoesandko on Talk Tennis forum. It will be interesting to see if Pospisil can be keep this momentum going further into the Indian Wells draw. He definitely has the potential to do so. What this means for Andy Murray’s season is hard to say. He won in Dubai, but can’t be satisfied with a 4th round exit in the Australian Open and this disappointing first round loss. Let’s see what Murray shows up in Miami. He surely needs to steer the ship in the right direction if he wants to remain in the number one spot. Here are the highlights from the Pospisil match. Kudos to TennisTV.